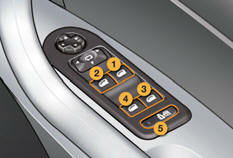 Fitted with a safety anti-pinch system and a deactivation system to prevent misuse of the rear controls. 3. Rear right electric window. 4. Rear left electric window. 5. Deactivation of the rear electric window and door controls. Press or pull the control gently. The window stops when the control is released. Press or pull the control firmly. The window opens or closes fully when the control is released. The electric window controls remain operational for approximately 45 seconds after the ignition is switched off or until the vehicle is locked after a door is opened. If one of the passenger windows cannot be operated from the driver's door control panel, carry out the operation from the control panel of the passenger door concerned, and vice versa. After approximately ten consecutive complete opening/closing movements of the window, a protection function is activated which only authorises closing of the window to prevent damage to the electric window motor. when the window has reached the low position, press the control again for approximately one second. For the safety of your children, press control 5 to deactivate the rear electric window controls regardless of their position. This control also deactivates the interior controls for the rear doors (refer to the section "Child safety - Electric child lock").